While many contemporary composers are often hesitant to write for harp, perhaps due to its inherent diatonic nature, other composers like Bernard Andrès excel at it, and find ways of composing for harp that make you believe it is a chromatic instrument. Andrès is one of the most widely performed composers of harp music, and his works are regularly performed by the world’s greatest harpists. His music fuses contemporary techniques with lyrical melodies and a strong sense of form, and he seamlessly integrates French tonal tradition with a more modern atonal sensibility, creating a hybrid musical form that is all at once engaging and distinctive. Of the two harp duos by Andrès performed this evening, Le Jardin des Paons (The Garden of Peacocks) is the most recent, having been completed in 1993. In this piece, Andrès call on the performers to execute many colorful effects, including fast enharmonic trills between two adjacent notes tuned to the same pitch, harmonics (playing strings while touching the node, creating bell-like tones that sound an octave higher), pinching instead of plucking strings, and gentle glissandos that cascade over each other, creating delicate, feathery textures. Andrès has said that this work is inspired by the relationship between Zeus and Hera, who were not only husband and wife, but also brother and sister. (Incestuous relationships are not an unheard of phenomenon in Greek mythology, and even their parents, Cronus and Rhea, were married siblings.) Of course, since the Peacock was sacred to Hera, we have to wonder where Andrès derived the image of a garden of peacocks. In Hellenistic imagery, Hera’s chariot was said to be pulled by peacocks. The eyes in the peacock’s feathers come from Argus, whose hundred eyes were placed in the peacock’s feathers by Hera in memory of his role as the guard of Io, a lover of Zeus that Hera had punished. The eyes are also said to symbolize the vault of heaven and the “eyes” of the stars. It is not known whether Andrès was inspired by these images in particular, so we are left to our own imagination and should feel free to read into this beautiful piece in our own way. The first movement, Trinidad Scorpion, is inspired by a fiery red pepper called the Trinidad Scorpion “Butch T”, currently the hottest pepper in the world. It measures a blistering 1,463,700 Scoville Heat Units (SHU). (A typical jalapeno pepper measures around 5,000 SHU, while a habanero pepper measures up to 350,000 SHU.) The tempo is appropriately marked con fuoco, and the contrapuntal middle section is subtly infused with Ca- lypso rhythms. Promenade à deux is the title of the second movement, borrowed from a colorful description of the scor- pion’s complex courting and mating ritual. This begins when the male and female locate and identify each other using a mixture of pheromones and vibrational communication. The courtship starts with the male grasping the female’s pedipalps with his own; the pair then perform a “dance” called the promenade à deux. The courtship ritual can involve several other behaviours such as juddering and a cheliceral kiss, in which the male’s claw-like mouthparts grasp the female’s. In some cases, the male will inject her with a small amount of venom, perhaps as a means of pacifying her. Once mating is complete, they separate. The male generally retreats quickly, most likely to avoid being cannibalised by the female, although sexual cannibalism is infrequent with scorpions. Scorpions glow fluorescent under black lights, so I imagine the scorpions basking in a fluorescent afterglow after completing their courtship. The third movement, The Tale of Orion, is inspired by an ancient Greek myth. According to legend, Orion boasted to goddess Artemis and her mother, Leto, that he would kill every animal on earth. Although Artemis was known to be a hunter herself, she offered protection to all creatures. Artemis and her mother sent a scorpion to deal with Orion. The pair battled and the scorpion killed Orion. The contest was apparently lively enough to catch Zeus’s attention, so he raised the scorpion to heaven and afterwards, at the request of Artemis, did the same for Orion. This served as a reminder for mortals to curb their excessive pride. A second version describes Orion and Artemis growing fond of each other. Learning of this development, Apollo, Artemis’s twin brother, grew angry and sent a scorpion to attack Orion. After Orion was killed, Artemis asked Zeus to put Orion up in the sky. So every winter Orion hunts in the sky, but every summer he flees as the constellation of the scorpion approaches. 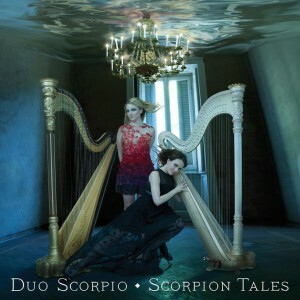 Scorpion Tales was commissioned by harpists Kathryn Andrews and Kristi Shade of Duo Scorpio through a grant from the American Harp Society. In general a raga opens with a simple and quiet musical statement that is gradually amplified until all the elements of the music intertwine and catch fire. Everything begins in this raga with a strange drumstick sliding on the metal strings of the harp to make a plaintive, distant sound; it resembles the song of a whale on the high seas. And off we go, riding the waves, until we come ashore in India with one of that land’s typical scales. We buy several percussion instruments, and then sail off again with the good old pentatonic scale oscillating between minor and major, spiced up by bells and antique cymbals … A raga for two harps with Indian spices and delicate Western flavors. Commissioned by the Canadian Broadcasting Corporation for “Québec in concert” production, the Raga was composed in 2006 for harpists Judy Loman and Jennifer Swartz. Parvis was composed in 1974 and is in two sections, Cortege and Danse. The ever-present tuning key is used as a percussion instrument, with the harpist tapping on her tuning pins as well as using the tuning key in place of fingers to strike individual notes and to evoke metallic, forceful glissandi. The Danse movement is an energetic 7/8 moto perpetuo rhythm punctuated by quick downward glissandi played with fingernails, and numerous sections featuring the dry, percussive sound of notes being plucked close to the soundboard. Often put in the same category as his elder Claude Debussy, the French composer Maurice Ravel claimed to have “always personally followed a direction opposed to that of the symbolism of Debussy.” Although he had an interest in following fashion, dressing with “showy ties and frilly shirts,” he was an innovative precursor when composing music. He was a perfectionist, always expending his palette of styles using traditional forms and folk tunes, shying away from the new Schoenberg trend of atonality. He was known for his melodies, instrumental textures, and effects always attentive to form and craftsmanship. In 1917, Ravel attended a chamber-music concert featuring in his piano trio (1914) performed by violinist Hélène Jourdan-Morhange (1888-1961). She was an advocate of the music of her time. The first impression she had of Ravel was of a shy, nervous, stammering fox. Ironically, Ravel always compared Morhange’s manner to a cat. The fox named his prey, “Moune,” after his favorite Siamese cat. 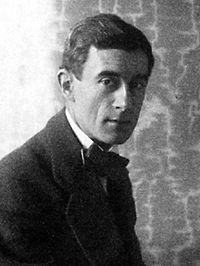 Although no information was found on an existent love relationship in Ravel’s life, Manuel Rosenthal (1904-2003), a disciple of Ravel, explained that Ravel once asked Moune to marry him. Embarrassed, she had to say “no” and explained though she loved him very much, they were not compatible for marriage. She remained one of his closest friend, his confident and his technical consultant when composing for violin. In a 1920 letter to Moune, Ravel expressed the desire to compose a violin concerto for her, but instead he dedicated the sonata for cello and violin (1922) to her, and he composed the sonata for violin and piano for her in 1927, even though he always considered the violin and piano acoustically incompatible. Ravel explained that while writing the sonata, he imposed on himself the independence of the two instruments showing and emphasizing their incompatibility rather than balancing their contrast. When listening to the first movement, a sonata form, imagine a cat’s journey with the elegance of the violin’s lyricism and the short and curious interruption of the piano. The second movement, a blues, demonstrates Ravel’s taste for American jazz. The violin’s melody slides with one finger from note to note to imitate a saxophone while the piano simulates strummed guitar chords. The final movement, a perpetuum mobile, starts with hesitating figures to launch a high-speed, perpetual motion showing off the violin’s virtuosic capabilities. When starting to compose this piece in 1923, Ravel had Hélène Jourdan- Morhange’s playing in mind, hoping that she would première the sonata. By the time the work was finished in 1927, her severe arthritis prevented her from performing it. It was the Romanian composer and violinist Georges Enescu (1881-1955) with Ravel himself at the piano, who premiered the sonata in Paris on May 30, 1927. Maurice Ravel first heard the Hungarian violinist Jelly d’Aranyi (1893-1966), the grandniece of the famous violinist Joseph Joachim (1831-1907), at a private musical salon in England in 1922. Both d’Aranyi and Bela Bartók (1881-1945) were performing Bartók’s own sonata for violin and piano No. 1. Ravel was amazed by d’Aranyi’s musicality and flawless technical ability. He asked d’Aranyi to play Gypsy melodies from Hungary for an encore, which she did well into the early morning, mesmerizing Ravel. He explained to his friend Bartók that they inspired him to write a short piece of diabolical difficulty, conjuring up the “Hungary of his dreams.” Despite his initial enthusiasm to write a Gypsy flavored virtuoso showpiece, it was not until two years later that Ravel began working on Tzigane. It took him only a few days to finish the piece for violin and piano, just in time for its scheduled première in London on April 26, 1924. Even though the dedicatee received the score only a couple of days before the performance, the piece was wildly successful with the audience. D’Aranyi made such a hit with Tzigane that Ravel later provided a version for solo violin and orchestra. Many European composers have been fascinated by the influence of gypsy music, as it contributes to the overall fabric of European culture. Ravel once said that if he would ever write something Arabian, it would be more Arabian than the real thing. The combination of Ravel’s rhythmical precision and his mischievous sense of humor, which can be found in his previous masterpiece La Valse, made reviewers perceive the piece at its première, as a parody of the “Liszt-Hubay- Brahms-Joachim school of Hungarian violin music.” Ravel described Tzigane as a virtuoso piece in the taste of a Hungarian Rhapsody. Ravel, who considered the violin and piano acoustically incompatible, gives the entrance to the violin alone, specifying the dark, rich sound of the G-string for the first twenty-seven measures. This makes the piece unique, beginning with a cadenza. The sweeping piano enters as a safety net under the whispering violin double-stops tremolo, providing a dramatic entrance. The soloist is propelled through a series of virtuoso passages to a fiendishly difficult dénouement. Although its leaping double- stops, harmonics at blinding speed, and combination of left and right hand pizzicato passages have kept many violinists up late, its difficulties go beyond the technical. Freewheeling rubato and sudden tempo changes diabolically pull the performer apart between sentimentality and blurry speed, much in keeping with the greatest gypsy folk tradition. La belle époque, which began during the late 19th century and lasted until World War I, was marked by Franco-Belgian composers Fauré, Saint-Saëns, Debussy, Ravel and also a Spanish influence in Paris. During this period, musical salons were the favorite meeting places for musicians. These salons represented places where upper class individuals hosted important public figures, artists, writers and musicians. The music in this program included works that were commissioned by, dedicated to, or premiered in, a salon. Women essentially ran the salons. One can appreciate the important role that they played in promoting musicians and circulating their music. Major debates focus around the relationship between the French salons and the public sphere as well as the role of women within the salons. At a time when society was defined and regulated almost completely by men, the musical salon provided a place for women to exercise a powerful influence. Women were the center of life in the salon, and they carried a very important role as regulators. These women were usually clever and brilliant, but at that time their cleverness and brilliance were primarily geared toward introducing their friends to new ideas and ways of life through happenings at the salons. Their particular gift was to inspire others. Much of the fascination that gave them such power in their day still clings to their memories. Although Debussy did more to expand the possibilities of form, harmony, voice leading, and timbre than any other composer of his era, ten years before his death, he had yet to compose any music for violin. Arthur Hartmann (1881-1956), a brilliant Hungarian-born American violinist, helped solve this matter. In 1908, he attended a performance of Debussy’s opera Pélléas et mélisande (1902). Hartmann fell in love with Debussy’s music and sought out the publisher to acquire any violin music that Debussy might have written. Unfortunately, the publisher’s response was not one Hartmann wanted to hear. Hartmann then contacted Debussy directly and commissioned a work for his tour in United States. Since Debussy had little time to compose any violin music before the violinist’s next recital, Hartmann asked the composer for permission to transcribe some of his songs to the violin. The request was well received and started a friendship between the two musicians. In 1914, Debussy accompanied Hartmann in a recital that included the three transcriptions Hartmann had created from Debussy’s music. Il PLeure Dans Mon Coeur is a movement from Claude Debussy’s song cycle Ariettes Oubliées for voice and piano written between 1885 and 1887. These settings of some of the best-known poems of Paul Verlaine (1844-1896) mark Debussy’s transition from a traditional composer in the style of Charles Gounod (1818-1893) to a more individual artist. Debussy’s music of Il Pleure Dans Mon Coeur”expresses the melancholy of Paul Verlaine’s (1844-1896) poem, this soft and light melancholy of the hearts who don’t know why they are sad. La Fille Aux Cheveux de Lin, meaning The Girl With Flaxen Hair, is the eighth number of Claude Debussy’s Préludes, Book I (1909-1010). The piece originally written for piano solo was inspired by Charles-Marie Leconte de Lisle’s (1818-1894) poem La Fille Aux Cheveux de Lin (1852) in the book of poetry Chanson Ecossaises, meaning Scottish Songs. Claude Debussy’s Beau soir (Beautiful Evening), one of his youthful works, represents a stage of orthodox romanticism, which later lessened with musical mastery. With poetic texts taken from a collection entitled Les aveux (Confessions) by Paul Bourget (1852-1935), a personal friend, Debussy depicts the poet’s desire to be happy and enjoy life on a gorgeous evening, even though death is inevitable. The French composer, Germaine Tailleferre, was the only female member of the famous Les Six, a group of French composers who met at the Conservatoire de Paris around 1912 and became very close friends. The group included Georges Auric (1899- 1983), Louis Durey (1888-1979), Arthur Honegger (1892-1955), Darius Milhaud (1892- 1974), Francis Poulenc (1899-1963) and Tailleferre. Their music is often seen as a reaction against the musical style of Richard Wagner and impressionist music. Tailleferre started composing short works at a very young age. Despite the opposition of her father, she auditioned for the Conservatoire de Paris in piano and solfège. In 1913, she won the first prize in counterpoint and harmony at the Conservatoire de Paris. During that successful year, she wrote Berceuse, which she dedicated to her professor Monsieur H. Dallier. Berceuse, meaning “lullaby” in English, is very well written for violin. The flow of the melody without constraint and ease seems as if inspired by Gabriel Fauré. Lili Boulanger, the younger sister of the famous French composer Nadia Boulanger (1887-1979), was the first woman composer to win the Prix de Rome in 1913. French composers Hector Berlioz and Claude Debussy had previously won the prestigious award. In 1914, while studying at the French Academy in Rome and recovering from a severe illness, Lili Boulanger composed the tone poem, Cortège, here a lively and festive piece. The term “cortège” is used to describe either a slow procession or a victorious march. Boulanger appears to have written the piece in the “happy mood” showing her strong and positive character to overcome her illness. Lili Boulanger dedicated Cortège to violinist Yvonne Astruc (1889-1980), a violinist and friend of the family who had often come to play at the Boulanger household. According to Darius Milhaud (1892-1974), Astruc’s “manner of playing is both purposeful and expressive.” In 1937, a French journal, “Le Petit Radio,” described her as the “Ambassadress of the French Musical Art” due to her noble style of playing, the beauty of her sound, and her impeccable technique. The French government awarded her the prestigious French Légion d’honneur. She premiered works dedicated to her like Darius Milhaud’s Concertino de printemps (1934) and Germaine Tailleferre’s violin concerto (1936). 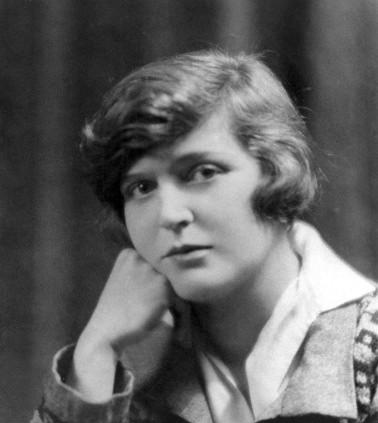 After Lili’s death in 1918 at the age of twenty-four, Yvonne Astruc and Nadia Boulanger recorded Cortège in 1930, pairing it with Nocturne, also written for violin or flute and piano dedicated to Marie Danielle Parenteau. This little piece that Lili composed in 1911 was written in the impressionist style. It starts with a long pedal C in the piano, over which a hauntingly beautiful violin melody moves. The two voices push each other to a central powerful climax, which then fades back to its earlier, gentle atmosphere. Concert attendees were encouraged to listen for Lili’s musical quotation of Claude Debussy’s Prélude à l’après-midi d’un faune (1892-94) and Richard Wagner’s Tristan und Isolde (1857-59). One of the leading salonnières of the Parisian musical scene, Pauline Viardot (1821-1910) born Garcia, is one of the little-known heroines of French music. The New Grove Dictionary of Women Composers describes her as an accomplished woman. She was a mezzo-soprano and composer, taught at the Paris Conservatory, and presided over a music salon in the Boulevard Saint-Germain. Through her salon, she helped launch the careers of many composers, including Camille Saint-Säens and Gabriel Fauré. For the young Fauré, Pauline Viardot “was by far the most glamorous female musical personality that [he] had ever encountered.” When composing his first sonata for violin and piano, in A Major, at the age of thirty, Fauré was courting Marianne Viardot, Pauline’s daughter. It was for Marianne’s brother, violinist Paul Viardot (1857-1941), considered a great salon player by the brilliant violin pedagogue, Carl Flesh (1873-1944), that the sonata is dedicated. In the first movement the melodies unfold one after another, creating a propelling momentum. The elegance is complemented by youthfulness, and hopeful, refreshing qualities. The music flows on without constraint and with ease. The second movement is both tender and melancholic. 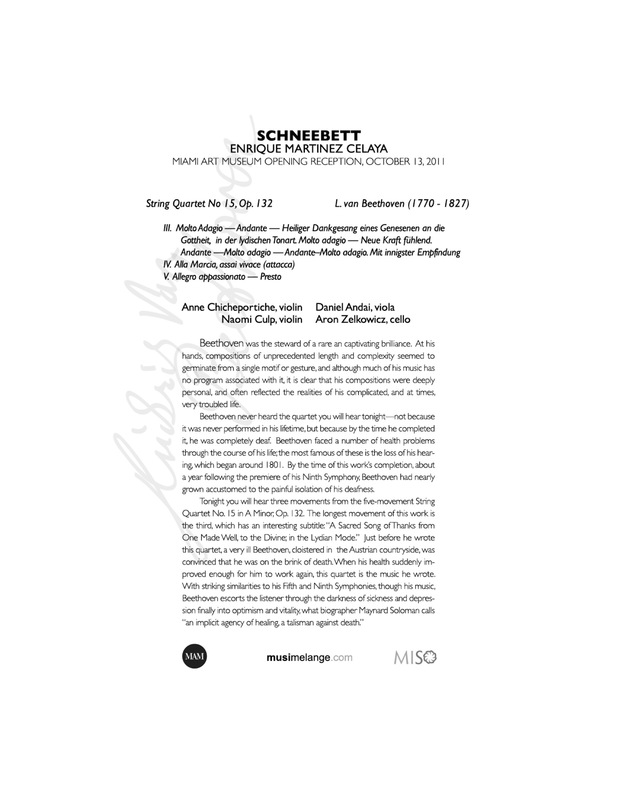 The third movement, although written in 2/4, is like a “Scherzo;” and it is considered to be a masterpiece of French musical wit and brilliance. It displays a lightness and fast tempo in the outer parts with a rich middle section. This style became a prototype for later scherzo movements by both Ravel and Debussy. The final movement concludes brilliantly, lending boldness to a splendid work filled with beautiful, impassioned melodies.